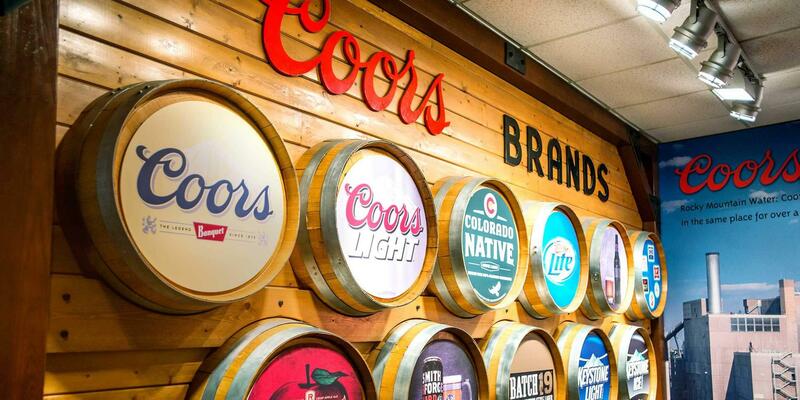 The Coors Brewery Tour showcases our history and passion for brewing in a 30-minute look at our malting, brewing and packaging processes. We also share old photos, neon signs, historical beer cans, bottles and memorabilia from our archives. After your tour, enjoy beer samples in our Hospitality Lounge. Samples of our great beers are available in limited quantity to those 21 years and older with a valid, government-issued ID. Non-alcoholic beverages also are available. Finally, be sure to shop in the Coors & Co. gift shop for unique branded and Colorado-themed merchandise. Note: A small fee applies to visitors 21+. The tour is $5 for Colorado residents, $10 for other visitors, and no charge for active duty or veterans with military ID. All visitors over the age of 21 may opt for a short tour (samples only) or the full tour experience with a live tour guide, in which they are all eligible to enjoy three 8 oz. samples and receive a commemorative glass. Location: Tours begin with a bus ride to the brewery from the southeast corner of the visitor parking lot,13th & Ford Street, Golden, CO 80401. Transportation: The Coors Brewery Tour can be accessed by a combination of light rail and bus. Visit the RTD website to plan your trip. Click here for a map and driving directions. Contact Information: Click here to access the Coors Brewery Tour Facebook page for other details. Weather Hotline: In case of bad weather, call 1-866-812-2337 to confirm days and times of operation. Closed on Major Holidays: New Year’s Eve, New Year’s Day, Easter, Memorial Day, Independence Day, Labor Day, Thanksgiving Day, Black Friday, Christmas Eve and Christmas Day. Also, please note the tour is closed on Monday, April 22. Ages: Guests under 18 years old must be accompanied by an adult. Personal Items: As we are a manufacturing facility, please do not bring strollers, backpacks, bags or purses. Wallets, cameras and phones are allowed, and photos are permitted along the tour route. No storage is available on site. Service Animals: MillerCoors welcomes guests with disabilities on the Coors Brewery tour. However, given the nature, size and space of our facility, only service animals trained to do work or perform tasks for the benefit of an individual with a disability are permitted on tours. We cannot allow other dogs, pets or animals, including those whose sole function is to provide comfort, emotional support, companionship or therapy. Group and Special Needs Reservations: We are happy to accommodate group tours and those with special needs. Please contact our visitor operations coordinator, Monday–Friday, 7:30 a.m.–4:30 p.m., Mountain Time, at 303-277-2552 to make reservations for groups of 15 or more or for accommodations for those with special needs. Golden Area: For general tour information in the Golden area, click here.